Pub bosses have apologised after asking a group of trainee priests to leave their Cardiff venue, mistaking them for a stag party in fancy dress. The seven Roman Catholic seminarians had gone to The City Arms to toast Father Peter McClaren's ordination when they were asked to move on. But assistant manager Matt Morgan said they received a free round of drinks when the situation was explained. "They were all dressed in their black and white clothes," he said. "The staff thought they were a stag. We do have quite a few issues on the weekends with parties wearing fancy dress so it is our policy to turn them away." Father Michael Doyle, who knows the group, said the seven went to the pub in Quay Street to celebrate the ordination at Cardiff Metropolitan Cathedral of St David in nearby Charles Street. He added the pub was a favourite of his colleagues including the Archbishop of Cardiff, George Stack. "They arrived at The City Arms and they were dressed wearing the clerical collar," he said. "The doorman basically said something along the lines of, 'sorry gents, we have a policy of no fancy dress and no stag dos'." The students had started to leave when they were approached by the bar manager. "He basically said, 'you're real, aren't you? '," said Fr Doyle. "He invited them back in and when they walked back in the entire pub burst into a round of applause, and they had a free round off The City Arms." Fr Doyle said the group stayed at the pub most of the afternoon chatting to customers. Mr Morgan said the priests were "all great sports and saw the funny side of the situation". 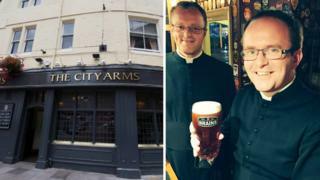 A spokesman for the Archdiocese of Cardiff added: "We'd like to thank The City Arms for being good sports through all of this and their kind gesture to our seminarians." What happens when travel is disrupted by stag and hen parties?